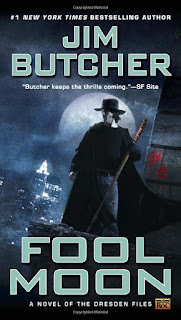 So it's been a while since I last read anything from Jim Butcher's Dresden Files. Having spent some time reading other material, I was really looking forward to finding out how the series would progress. That and I could see my husband positively twitching as I read anything but Dresden Files or Discworld. Be aware that there may be spoilers for Storm Front below. Fool Moon sees Harry about 6 months after the end of the previous book, and he is still feeling the negative consequences of it. Murphy doesn't trust him after he went after her suspect alone and withheld information about the case from her. As such, the work that he's gotten from the police has slowly been dwindling over the months. But when Murphy comes to him with what looks like werewolf attacks, it soon becomes clear that there is a lot more at stake than just his next paycheck. This is a pretty entertaining continuation of the series, and a far more entertaining subject. Much as werewolves have been overdone before, it's much more of a tangible threat than magical drug dealers and amps up the tension more than a human enemy would. With regards to the werewolves, it does take a fun turn and introduces several different types to worry about, from wizards who transform their bodies with magic, to humans empowering themselves with demonic items, to those unfortunate people possessed by a demon. The benefit of having all the different types be relevant at some point means that there is variation in strengths and weaknesses that accordingly varies up the action. Additionally, it was nice to see the consequences of Harry's actions coming back to bite him. Because, much as I like him as a character, he does have an annoying tendency to try and play protector, especially with the women in his life. And that most often means withholding information that he thinks would be dangerous for them to know. Honestly, that would be so much more irritating if it weren't obvious that the people he's denying information to didn't completely ignore his attempts to push them out of danger. I hope it doesn't go much further in the series though, because although I do relish seeing how it all backfires, I can see it getting really old really fast. Lastly, I liked seeing more of the human characters previously introduced. While I'm still a bit lukewarm towards Susan, I was more than happy to see more of Murphy and Johnny Marcone. I probably shouldn't, but there's a big part of me that adores the gentleman gangster. I look forward to seeing more of the police and Chicago's criminal underworld a lot more in further installments.